Feeling Unwanted In Germany, Some Afghan Migrants Head Home : Parallels Some 150,000 Afghan migrants arrived in Germany last year. But the Germans estimate more than half won't qualify for asylum. A small number have turned around and headed home. Yet the reason that Arian finally saw his mistake was not because something nasty or dangerous happened to him. It was because nothing really happened at all. When Arian arrived in Germany, he was placed in a migrants' reception center. "We had nothing to do in the camp," he says. "We just stayed there." He played a lot of soccer. He ate a lot of jelly sandwiches. He moped about. Officials wrote down his name. In the end, he says, he was in Germany for 10 months, yet "no one asked me why I went there and why I was there." No one seemed to want to listen to him explain why he should be allowed to stay. It also soon became clear to Arian that local Germans did not appreciate his presence. While people from the church and social workers helped the migrants and were "very nice," residents of the nearby village seemed hostile. "When we were walking along the sidewalk, people would avoid us," says Arian. Last year, 150,000 Afghans arrived in Germany. The German authorities estimate less that half qualify for asylum. German officials say that at present, a tiny number of Afghans — 1,600, according to estimates given to them by Afghan officials in Germany — are willing to go back home voluntarily. But many will have to leave, says Germany's ambassador to Afghanistan, Markus Potzel. "It means that more than half of them have to be sent back because they can't stay," says Potzel. "There are some obstacles for them to be sent back immediately, but we have a huge number of Afghans who are not eligible to stay in Germany and should be sent back." During Arian's time in Germany, he began to notice that Syrian migrants were being treated very differently. They were provided with language lessons and eventually passports, he says. "When we complained to the social workers, they responded frankly. They said, 'We've invited Syrians here, not Afghans,' " he says. This prompted some of Arian's fellow Afghans to stage demonstrations. "They were shouting, 'We don't want to go back to Afghanistan! There is a war there!' " he says. "But no one listened to them." The weeks rolled by. Arian was moved to another center. But still nothing happened. He grew steadily more convinced that he had no chance of being allowed to stay in Germany. Then depression set in. "I was in very bad condition. I couldn't sleep. I decided to go back to Afghanistan, before I went crazy," he says. Arian returned home last month. He was one of 125 Afghans sent back to Afghanistan on a charter flight organized by the German and Afghan governments. The passengers all signed a form saying they were returning voluntarily. Arian's family spent most of their savings on his trip to Germany. To pay the smuggler's bill of $7,500, they sold land and a car. Arian is now worrying about what his family feels about that. "So far, I haven't seen any reaction from them because I've just arrived back. But I don't know what's in their hearts," he says. Arian is faced with finding work amid rampant unemployment in a society where good jobs are very hard to find without political or personal connections — or cash for a hefty bribe. That much is clear from the experience of Shirdil Bayat, 40. He was deported from Denmark two years ago after a court rejected his request for asylum — which he'd based on a claim that his life was threatened by the Taliban in his home city, Kandahar. Lacking personal connections, Bayat took 16 months to find permanent work as an office cleaner in the capital, Kabul. He says returning home to Kandahar is still too risky. On a recent day when he was interviewed by NPR, he'd been laid off because of budget cuts. He says he has no idea what he'll do next. Bayat says returning to Afghanistan after having failed in Europe can be very humiliating. Some families are sympathetic, but far from all. "People jeer at you. They ask, 'Why did so-and-so get citizenship in Europe while you did not? Maybe you're useless,' " he says. The Germans are running a PR campaign in Afghanistan, trying to deter Afghans from traveling to their land. They've posted announcements on billboards, buses and the Internet, urging Afghans to think twice before setting off. Germany views many of the Afghans who've arrived on its soil as economic migrants seeking jobs or education. German officials maintain that under international law, Germany is not required to grant asylum to those migrants — unlike Syrians, who are fleeing a war zone. The United Nations estimates that last year, some 11,000 civilians were killed or injured by conflict in Afghanistan. Afghans say that bolsters proof that there is war in Afghanistan, too — and that Afghans should therefore be granted protection by European nations. "Afghans are not leaving Afghanistan because of a lack of jobs, " says Ashraf Haidari, director-general of policy and strategy at Afghanistan's Foreign Ministry. "They are fleeing generalized violence. Terrorism that is killing men, women and children," he says. "That — and political uncertainty as a result of withdrawal of international forces and diminishing international development aid." However, Potzel, Germany's ambassador, says the situation in Afghanistan differs hugely from Syria's. "Here in Afghanistan, you don't have a government who would bomb their own population," he says. "Here, the government tries to protect their own people. There are unsafe regions and there are less unsafe regions in Afghanistan, and there are regions — especially in the big cities — where a sort of normal life is going on." Germany is one of the main international donors to Afghanistan. Over the past 14 years, it has poured a great deal of money into the country. It seems unlikely that it would wish to risk making Afghanistan still more unstable by forcibly returning large numbers of Afghans over a short time span. Yet there is considerable concern in Afghanistan about what might happen if significant numbers of angry and disillusioned young Afghans are eventually sent back from Europe. Some European countries provide financial support packages to help people settle in, but the sums are generally small and over a limited time period. Professor Sayed Masoud, an economist based in Kabul, foresees "disaster." "Either they will join the Taliban or become drug addicts," he says, "because the government can't provide jobs." Meanwhile, Afghans keep heading out on the trail to Europe. 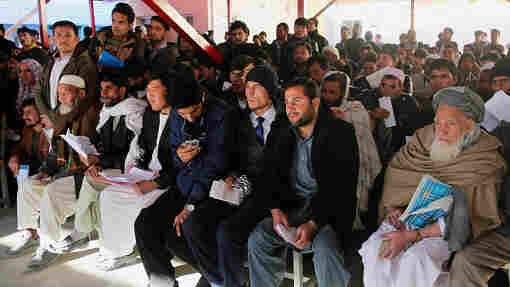 On a recent early morning in Kabul, hundreds of men were lined up outside the government office that issues passports. Among them was Wahidullah Mohammadi, 19, who wants to migrate to Europe to go to school. He is aware of the risk of being deported back home — and of losing the thousands of dollars he'll pay to smugglers. Still, he still thinks the odds are worth it. "The situation is not good here and there is no guaranteed future," he says. "This is why I have to accept this risk."